Decorated trees, Santa Claus - the symbols of Christmas. There's another. One that often gets overlooked, yet is equally as prominent. It's classic, it's everywhere, and every family has nibbled on this tradition at some point. The moment you pop off the lid, a confusing aroma of salts and sweets tickles your nose. Like the Holy Trinity, there are 3 flavors divided equally. The semi-stale, yet still delicious tastes of butter, cheddar, and caramel are right before you. Small nibbles, big handfuls, one flavor, all flavors - there's no wrong way to eat from the popcorn tub. It's a symbol of Christmas with no rules. TMNT has been quiet in the popcorn tin arena. I haven't seen any for sale in decades. But here in 2016, the iconic symbol of Christmas returns with Turtle Power. And for only five bucks! 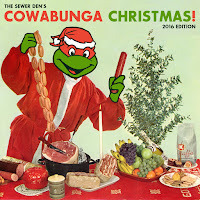 Not only does it feature the Turtles, but it's also chock-full of holiday visuals. The blurb of text, Crimefighting Holiday Heroes, plays it safe, avoiding the word Christmas, and swaps it with a mouthful of a phrase. It's ultra cheesy, dorky wordplay right out of the 90s. It's so bad, it's good. 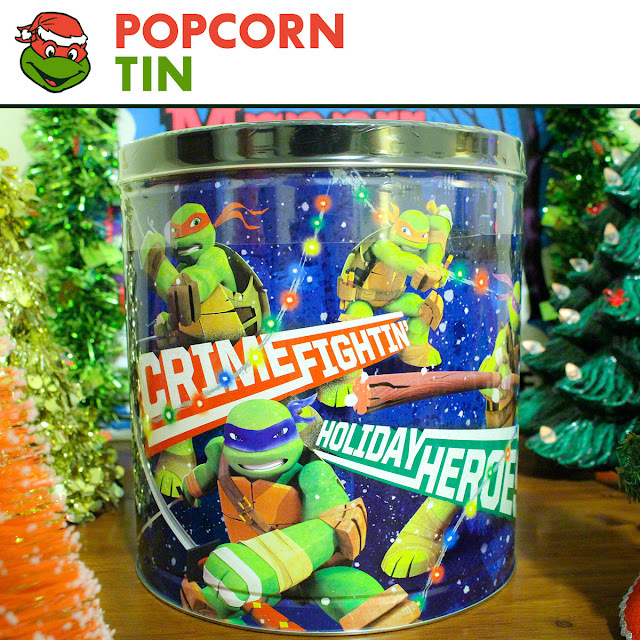 The return of the TMNT popcorn tin is epic. It's awesome, like seeing Home Alone on IMAX awesome. I want to be a filthy animal and eat the entire tub in one sad, yet beautiful sitting. Buttery, cheesy, caramel-y crumbs will sit on top of my lap like trophies on a mantel. The tub itself, my memento from this joyous occasion, will be used like all tins from Christmas popcorn gifts, as a trash bin. My Christmas Day dreams, my Christmas Day delusions.